I feel like the title of my post makes me sound like I’m rolling my eyes because I’m sick of this pattern, when actually the opposite is true. I love it! 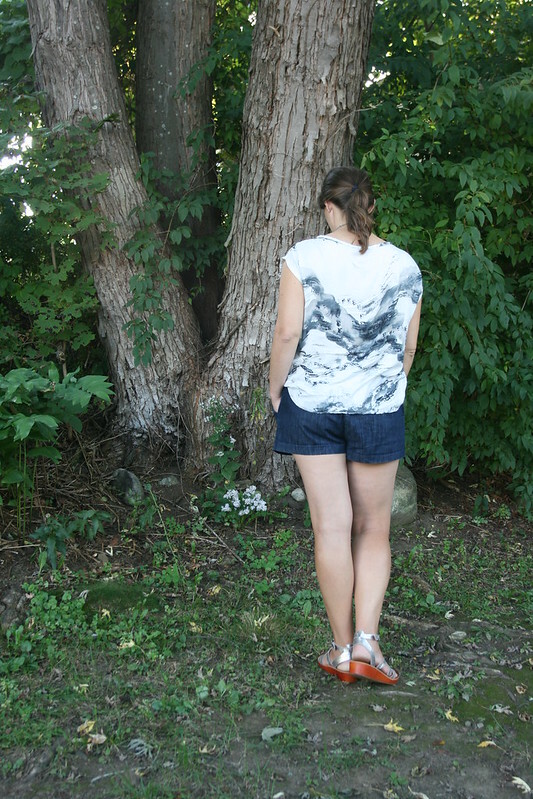 This simple shirt is the meeting of this beloved pattern and the remnants of some beautiful fabric. 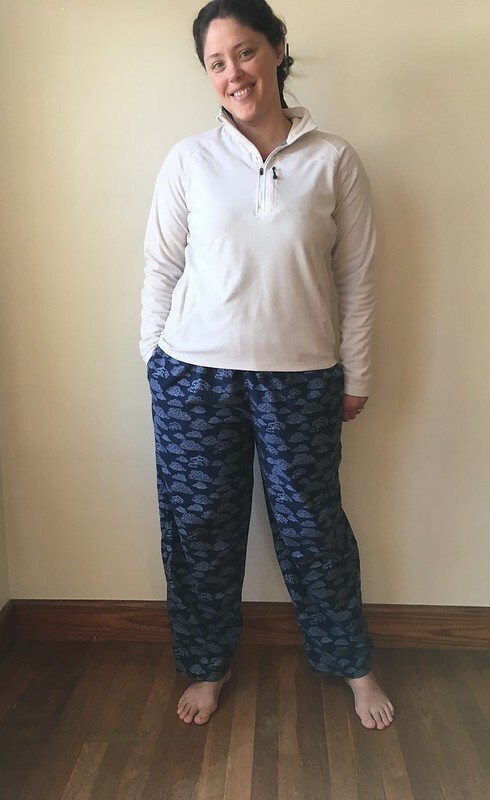 This is McCall’s 6848 which I also made in black silk crepe de chine, and it’s actually a pajama pattern! In a fabric with some drape, however, like this watercolor rayon, left over from my Hannah Dress, this pattern also makes a perfect drapey shirt. 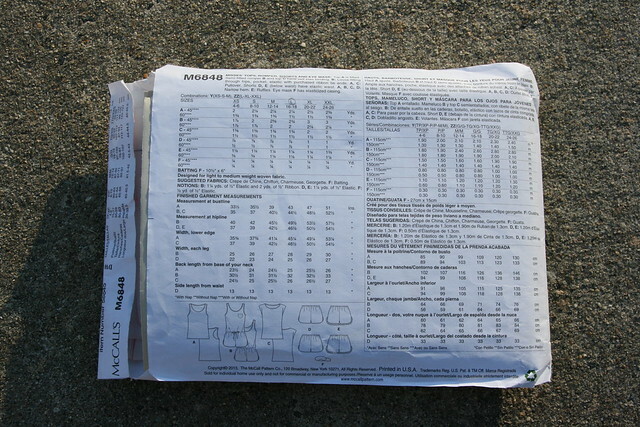 McCall’s 6848 comes together quickly and easily with only three pattern pieces, one of which is the bias neck binding. 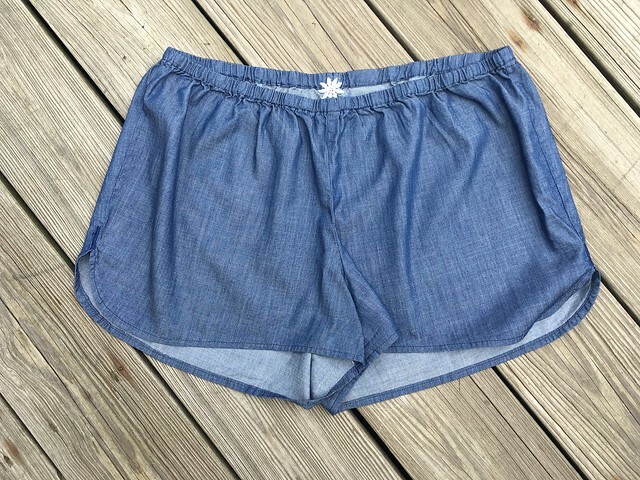 It’s a quick sew and a great palette cleanser after a more complicated project like the Hannah Dress or Thurlow Shorts. I didn’t do anything different on this iteration of the shirt. Like last time, I used French seams to finish the insides and double turned hems on the bottom and armholes. The rayon I used is a little harder to work with than the silk crepe de chine was, but it’s so soft and beautiful that it makes up for it. It was also nice to compare the two fabric types on the same pattern. 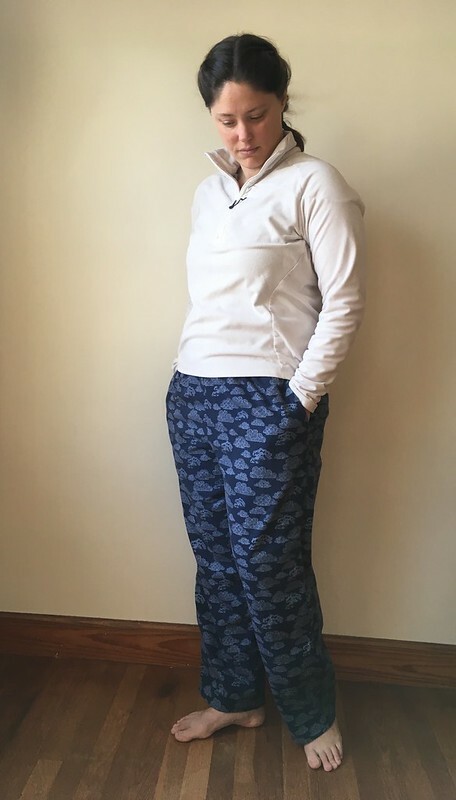 So far, crepe de chine is my preference to work with–both are excellent to wear. This was one of my 2017 Summer Sewing projects. I only have one more of those to blog, and then I’m all caught up with summer. 😉 It all works out, though, because I’m planning to slow down a little for fall and experiment with various areas of sewing that I’ve been interested in. We’ll see how that all works out. 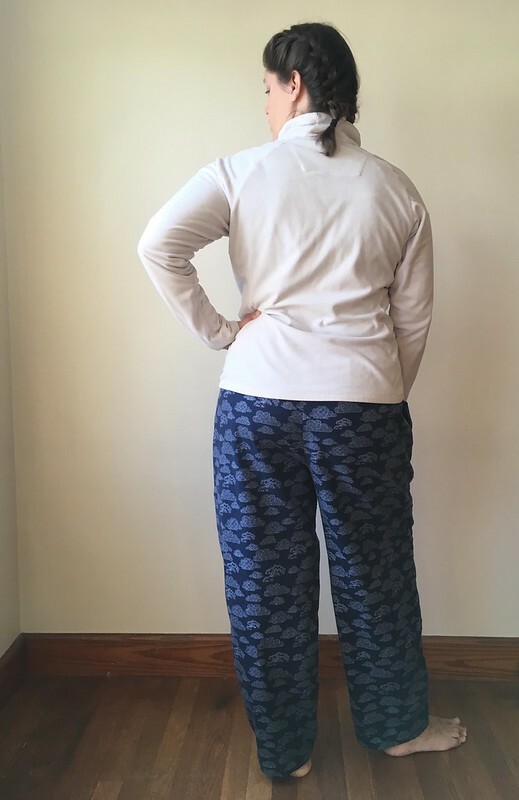 I highly recommend this pattern to anyone looking for a quick and easy project that will make a great top for every day (or pajamas) in the right fabric. Mary of Birch Dye Works is really knocking it out of the park with all the cool yarn she has been dying lately. Her color names are pretty great, too. I was reading the Oliver + S blog and Liesl pointed out all the creative quilting influences she found in the September issue of Vogue. Check out her post here. Are you thinking about sewing skinny jeans? 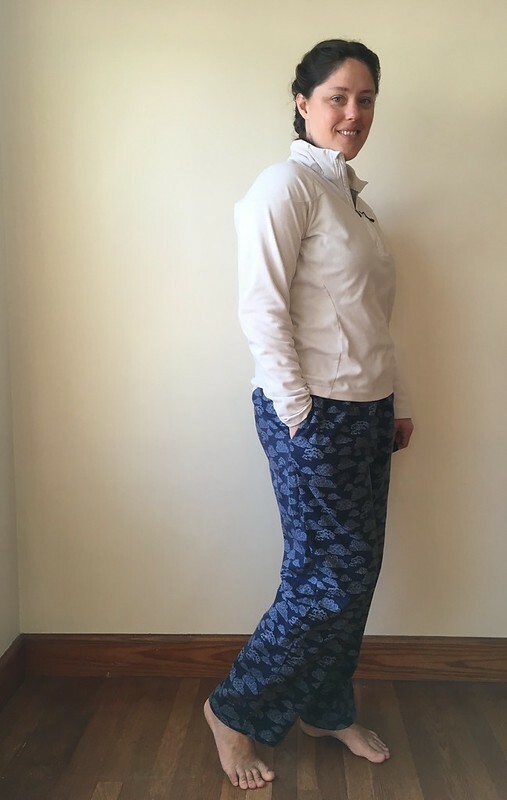 Judith Dee compares three patterns on her vlog. It may be September, but summer isn’t over until the first day of fall on September 22, so it’s been shorts-land over here lately. 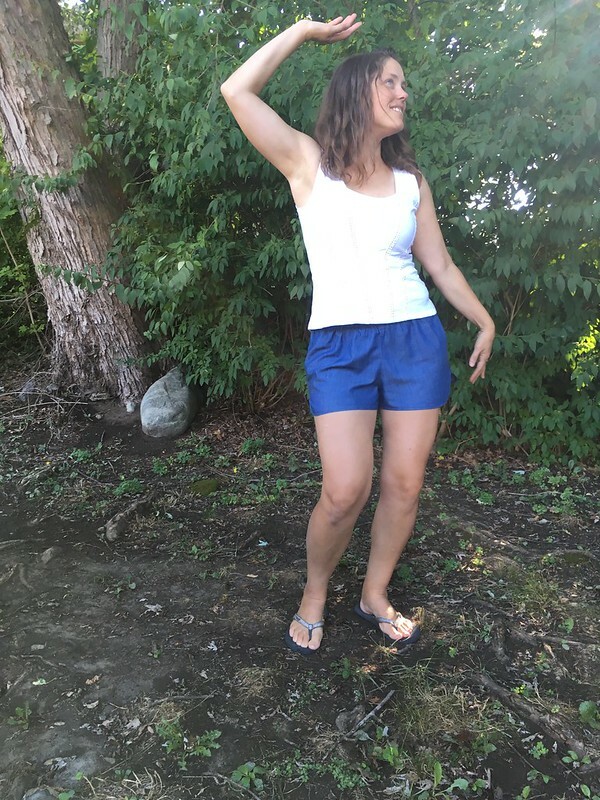 Yes, Shorts-Land is a place, and that place has been my house, where I’ve been sewing up a ton of basic and not-so-basic shorts this summer. 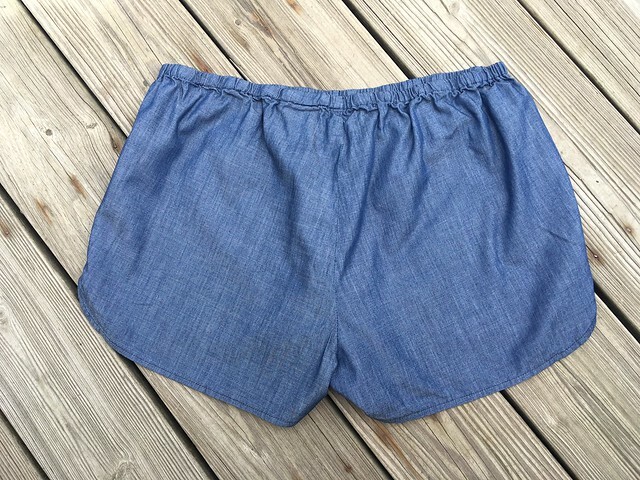 Like many aspects of sewing, I’ve been putting shorts and pants off because I didn’t know how to fit them, but I also know that I really need to try if I’m ever going to learn. McCall’s 6848 is a pattern I’ve been tweaking little by little, and I think I finally have it right. 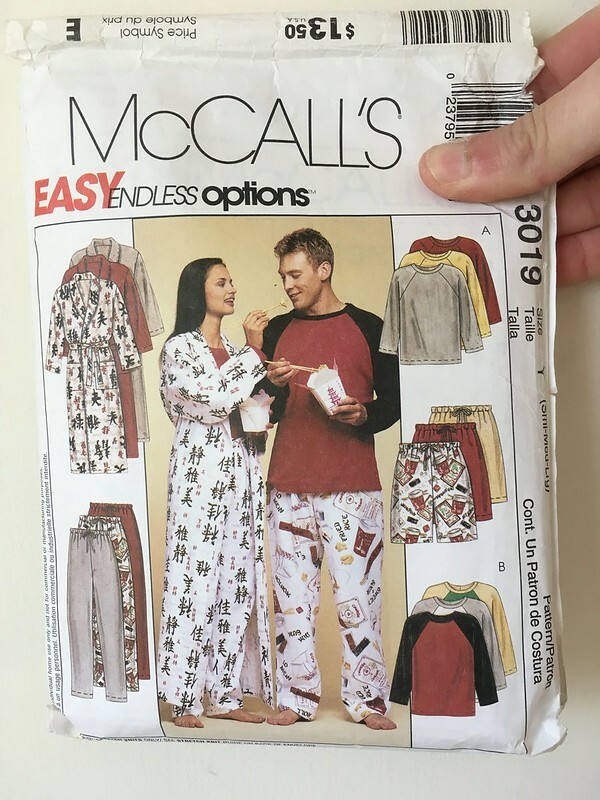 This is actually a pajama pattern, but after making my first pair of shorts from it (View D), I realized this it was going to be more of a summer staple than pajamas. 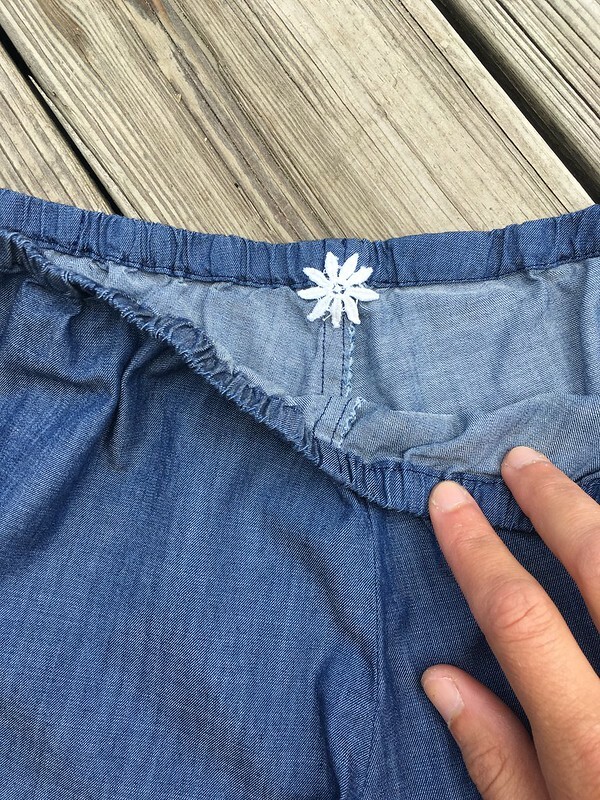 One thing I’ve found in the little bit of pants/shorts sewing I have done is that bottoms sometimes feel as though they are too high in the front and too low in the back for me. This was definitely the case with my first pair of these shorts. So, I got out the good ol’ Singer Sewing Reference Library books and looked up fitting, until I came up with some ideas. 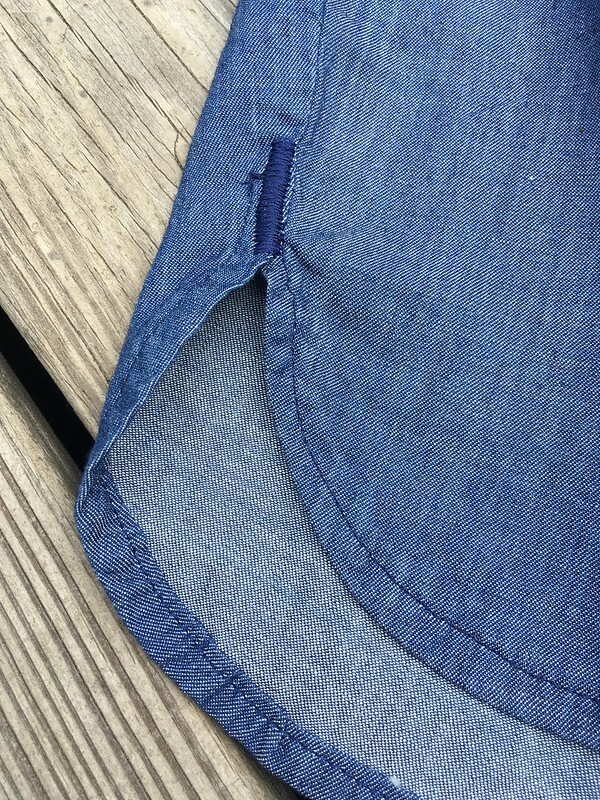 For my second pair of shorts, I took a wedge out of the front and added a wedge into the back. This got my shorts really close to what I wanted, but the front legs felt just a little…well, not tight, but not quite right–a little like they were pressing against me too much in the front of the legs. So, for this last pair, I lengthened the back crotch point just a bit and…finally just right!!! They feel exactly like I want them to. For this pair, due to my need for basics, I decided to try out the new Art Gallery Fabrics Denim. I got it at Pintuck & Purl in Exeter, NH (who, by the way, I’ve started doing some social media for, which is super cool). I was kind of skeptical about this thin fabric. 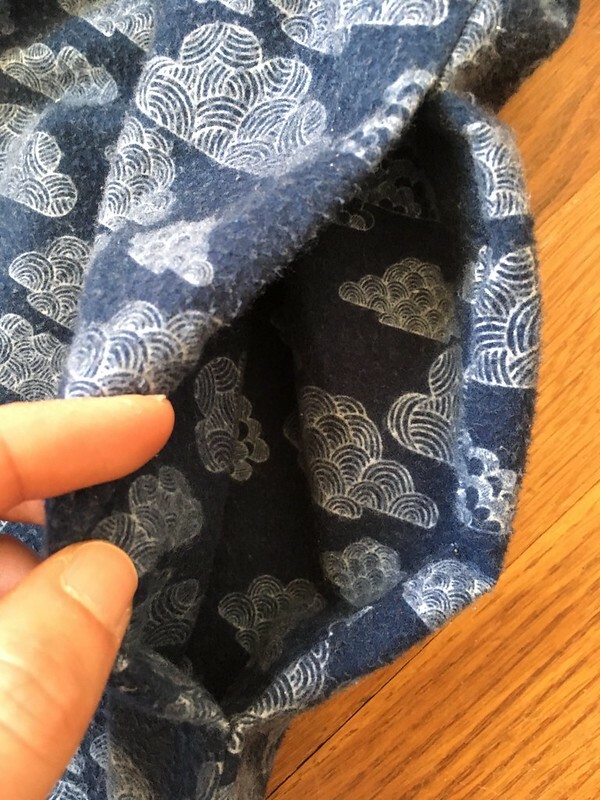 I didn’t really believe it was denim, because the weight is closer to a quilting cotton, although it’s much drapier. When you look at the weave, though, it really is a denim weave. All that to say, I was pleasantly surprised when I tried it. I managed to make these up before the road trip we went on in July, and they were perfect in the car. I guess it’s always a good day when you can wear something designed as pajamas in your everyday life. I even put a little lace flower in there as my back tag. The one extra thing I did (besides that flower) was add some long bartacks at the sides. 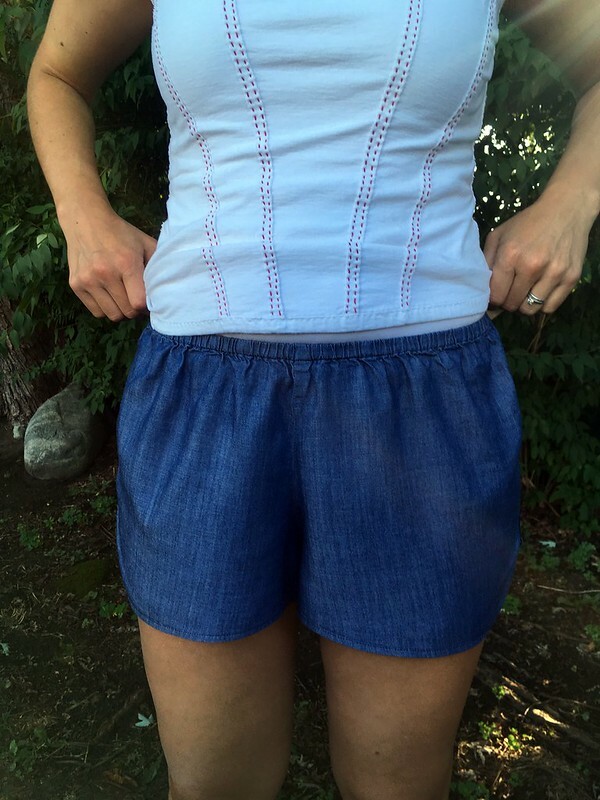 I know from experience that these shorts can catch on things…and rip. 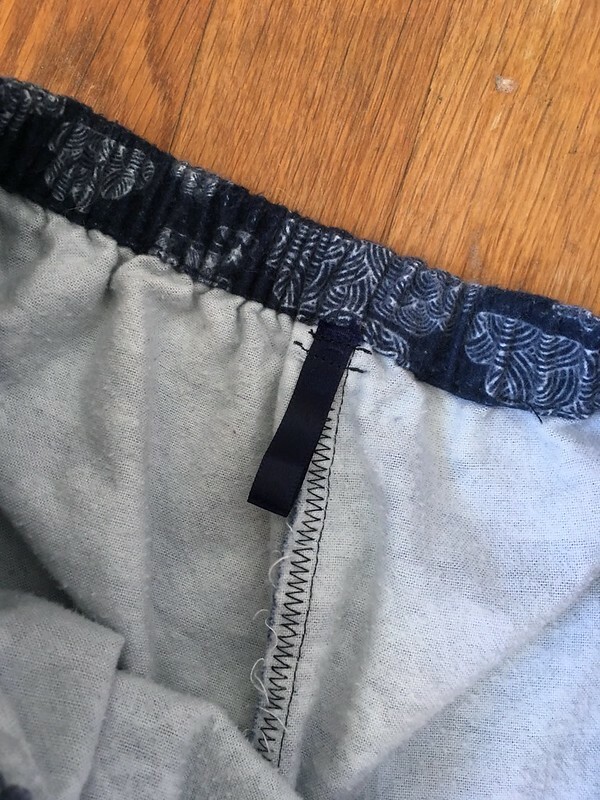 It’s no fun ripping a hole in the side of your new shorts. 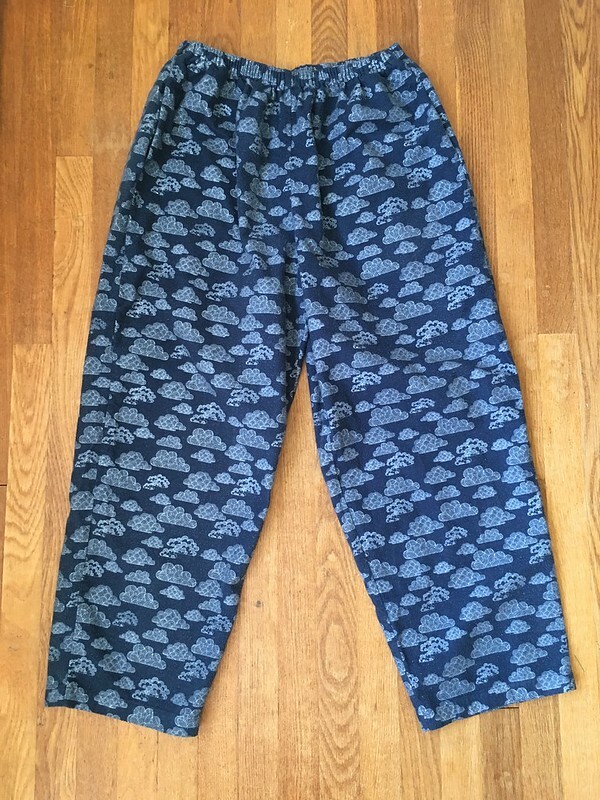 The only other thing I would change if I made these again would be to add pockets. It’s pretty annoying not to have any, but I think, at this point, I want to focus more on fit than modifying patterns with extra features. So, I’ll save it as a future idea. I’ve got to recommend it again–BRIMFIELD! It’s going on now, and if you are an antique-lover anywhere near western Massachusetts, I highly recommend you go. Brimfield is the largest outdoor antique market in the US and it’s going on this week until Sunday. You can find all the details at the above link. 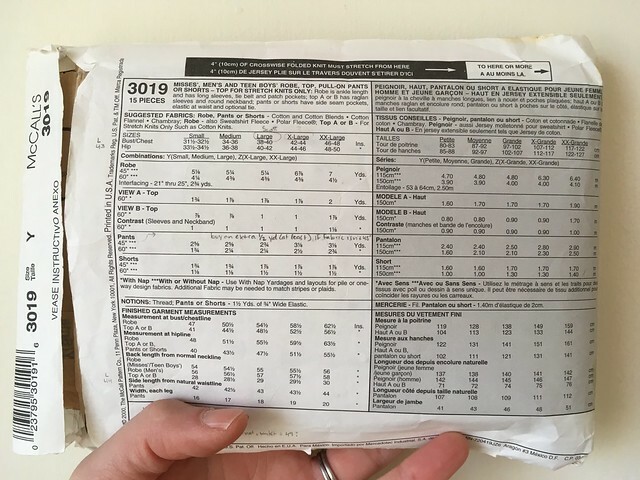 I tried one of the best recipes EVER on Monday. It was Bostocks from the Seven Spoons cookbook. It’s an amazing combination of day old brioche (like challah bread), orange simple syrup, and almond cream. It’s totally worth the work, and you can make the various elements ahead of time. Check your library…I bet they have it! How about more learning about fabric? Here’s a link to another of the Cotton + Steel substrate series. This time it’s all about their cotton/linen canvas fabric! Interesting!